The first thing of note about Blue Tongue Boulders is that it's private property. You'll need to check the access notes in the guide book ("Northwest Victoria - A Rockclimbers Guide") with respect to limitations. The second thing of note, is that the drive up is quite rough. If your transportation consists of the family sedan expect to bottom out and spin the wheels at least once. The solution, of course, is to park at the gate and hike in. It's quite a hot and dry place during summer, so bring the usual water, sun screen, hat, etc. If you're lucky you might spot an eagle putting in a hard day at the office. Oh, and as for Blue Tongue lizards - well I've never actually seen one there. Access is via a little, but steep dirt road just over the water carrier. (See: map and consult the guide). Above Right: The view from below Blue Tongue Boulders. The rocks are actually bigger than they look here, although we are talking boulders no higher than 20 metres. If this is your first visit, I suggest warming up on the trad climb "Drunk As A Skunk", the 20m grade 10, but do the grade 14 finish "The Skunk Steps Up" for a bit of action. 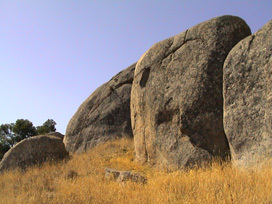 This route is situated on the set of boulders dominating the left of the picture above, and is often blessedly in the shade. 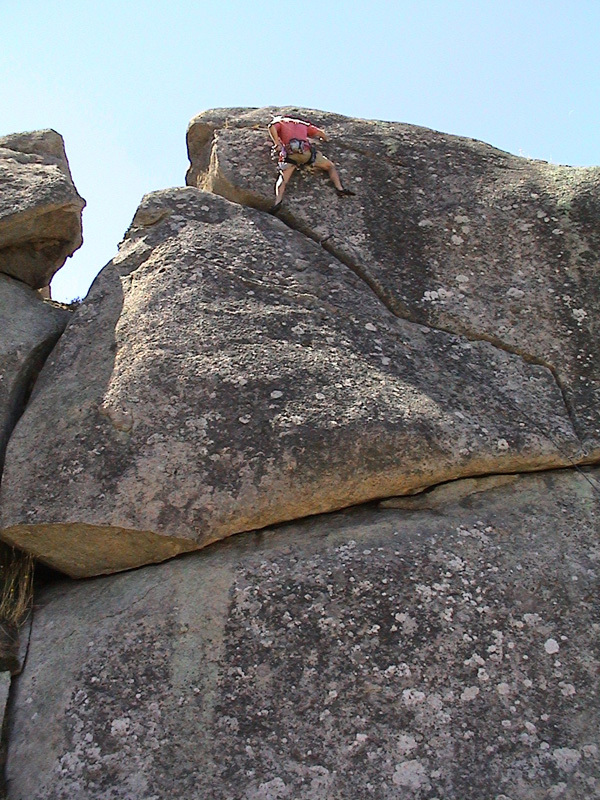 The climb begins on a short unprotected slab, before moving into a left trending hand crack with bomber foot holds. Follow the crack left, but don't exit left, instead, about a metre before the left arête, go for the grade 14 finish where a good crimper appears above and a high reach yields a horizontal crack (see picture above) that will accept micro cams. It's a nice finish to an easy climb. Above Left: Me leading "The Skunk Steps Up" 15m, grade 14. And me belaying atop same. Just to the right of "Drunk As A Skunk" is a "High As A Kite" a 15m, grade 17 vertical finger crack. I recommend you give this a shot, though if placing gear blindly whilst lay backing is not your thing perhaps pass the lead to your unsuspecting partner. (hehe). You can fill the finger crack with cams, so apart from the short, unprotected slab start (same as for "Drunk As A Skunk"), its a protectable, but strenuous route well worth ticking. On the next boulder to the left of "Drunk As A Skunk" you'll find "Shades Of Michelangelo" a 20m grade 22. I'm not sure it's worth three stars, but is never-the-less probably one of the better routes out there. Its a bolted sport route, but with a bit of static rope you can easily set a top rope on it if no one in your party is up for the lead. If you bag the onsight I'll be mightily impressed. The crux requires a one arm chin on a crystal the size of match head - okay, so I'm exaggerating, but not by much! Right: Shades Of Michelangelo 20m, grade 22 starts in the centre of this block and moves up to a bolt before the crux. Hint: try bearing slightly left of the line after you clip. Looking to your right as you stand below "Drunk As A Skunk", you'll see a moss slab (pictured left). 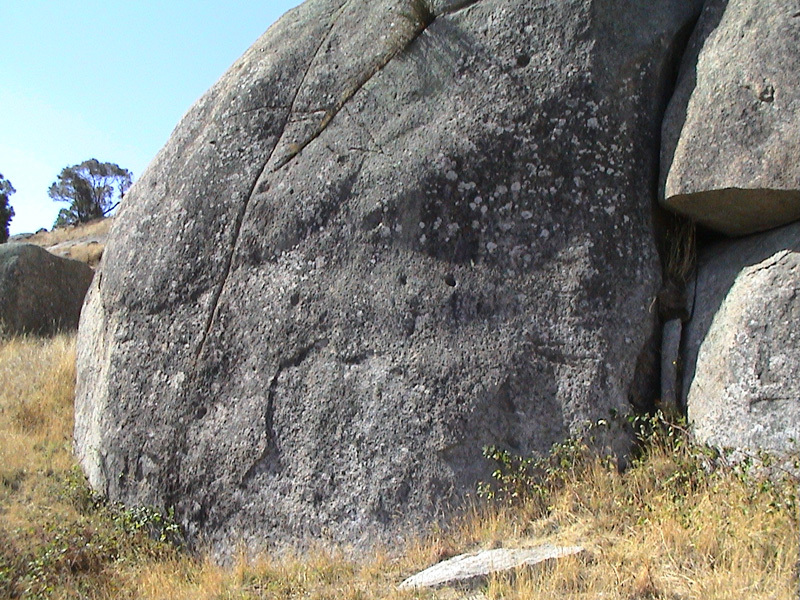 On this fine grained granite tor, you'll find "Kiss The Bolt", a 15m Grade 17. Its on the far left of the slab. A single bolt "protects" the opening moves which are also the crux. Many a climber has slipped trying to gain that first bolt. (Dare I suggest a stick clip?). Once you battle the opening moves your fingers dive lovingly into a horizontal break at about the 5m mark. After that the difficulty eases off a bit and its pretty much standard slabbing to the top, but wait for it, there's a run out of epic proportions. Unless someone's been up there lately and retro bolted the thing, you'll not find another bolt until the belay bolt a few feet down the slab from the top. I've "lead" the climb by setting up a static line with a couple of figure-eight-on-a-bite knots to clip into for the unprotected middle section. 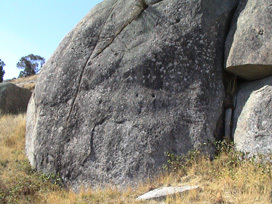 Above Left: "Kiss The Bolt" 15m, grade 17 heads up the left of the slab. Below Right: "Off Your Face" 8m, grade 20 heads up the centre of the small boulder in the foreground. Last, but not least, I'll mention "Off Your Face" 8m, grade 20, (pictured right), as a short but sweet climb. At 8 metres some might call it a high-ball bouldering problem, but in my opinion, it's a bold lead given that the landing zone is strewn with loose rubble. It's single bolt sits high enough to be out of reach until the first few moves are executed. There is at least a good hold to employ whilst clipping. I haven't lead it (yeah call me a wuss), but its a delightful top rope. Kent reports "...Shades of Michelangelo is well worth 3 stars...Off your face is as safe as houses to lead, as you clip off a jug bigger than anything in the YRock [Climbing Gym] and is worth a star and so is Face Painting. There's also a route between High As A Kite and The Skunk Steps Up with a bolt on it." And that's about it for my recommendations for Blue Tongue Boulders. A nice diversion, if you're a Mt Alexander regular. "The route mentioned at Blue Tongue boulders as being between High As A Kite and The Skunk Steps Up did have a name but I have forgotten what I called it. It is about grade 18 and worth doing. My climb Off Your Face sounds a bit dangerous in your description but has a no 2.5 or 3 friend in the horizontal above the bolt. Face Painting was an inspired lead on the day of the first ascent. I have not been able to repeat it without a fall since! I am not sure about the one-arm chin off a crystal on Shades of Michelangelo. More like a bit of technique required". - Chris Cope (Numerous FFA's and developer of the area).